TopConsumerReviews.com awards their best-in-class 5-star rating to Blinds Galore, an industry leader in curtain retailers. Blinds Galore sells an extensive line of custom and ready to hang curtains and window treatments in various sizes and materials, at budget friendly prices. 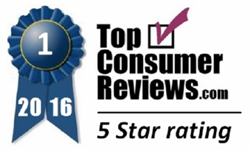 TopConsumerReviews.com recently awarded their highest five-star rating to Blinds Galore, an industry leader in curtain and drapes. For those people in search of quality made curtains and valances that look expensive and provide the right design aesthetic, the options available in local retail stores can be disappointing. Custom-made curtains and panels can run in the thousands of dollars, which is typically out of the question for most shoppers. Instead, many people have found that buying custom draperies online can provide a significant savings over their local décor shop. Similar to custom draperies, when buying online the shopper may first request sample swatches to compare with their paint and existing furniture. After finding the right fabric and look, the customer can place their order online. The turnaround for complete curtains is often much faster than a local shop. To find out more about Blinds Galore and other curtain providers, including reviews and comparison rankings, please visit the Curtains category of TopConsumerReviews.com at http://www.topconsumerreviews.com/curtains/. Based in San Diego, CA, Blinds Galore is an online retailer of custom brand-name window treatments. Blinds Galore has sold over one million window treatments to customers across the country. For over 12 years, the Blinds Galore team has been helping customers simplify the online buying process and to impart customer satisfaction and peace of mind. TopConsumerReviews.com is a leading provider of independent reviews and rankings of hundreds of consumer products and services. From Curtain Stores to Flooring and Window Blinds, TopConsumerReviews.com delivers in-depth product evaluations in order to make your purchasing decision easier.